Flying again. We have done it! We flew both aid cargo and disaster relief surveys in Xia-Xia in Mozambique in February. On return to South Africa, we have had a couple of months checking engineering and safety. We did not want it to be anywhere near that long. But this background work has to be done properly. Proper administration and engineering are absolutely key to safe flying. Now our helicopter is able to fly again in South Africa. Training pilots and helping people. Thanks for your patient support! Just because the helicopter can fly safely and well, it doesn’t mean that their are clients for it. The problem was that we did not have an Air Operating Certificate in South Africa. Not only did we not have the funds to by one, but we also did not have the locally trained expertise to maintain an AOC safely. So the helicopter was flying on another client’s AOC, and sadly there was not enough work. And there was other bad news. Our affiliate continued to seek to improve our joint disaster relief capability and bought a stretcher so that we could provide an air ambulance capability. There was a lot of work done getting the helicopter ready for this role. However, just as we were about to start, the local civil aviation regulations changed. This was a complete setback. Not only could we not fly the helicopter in a role that we really wanted, other than in an emergency, but the South African business had just spent precious money that we couldn’t recover financially. Things like this happen. But they are not welcome news. Sadly this is how we learn. We had another intense period of learning as our affiliate investigated other ways to keep our staff current in flying and to build the funds needed for the next disaster season. But there was a clue how we might get flying again in the right cause. 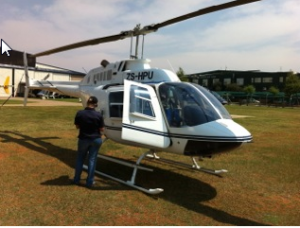 So we went to Durban and teamed up with HeliTractor and Legend Aviation (which was then known as King Shaka Aviation). That got us flying again. And we got into crop spraying, because the real need of the time was to produce food for the famine in the region.